Hotel Quito or Guayaquil, Lima, Cusco. Visit Quito, Lima, Cusco, Machu Picchu. Transfers, meals: 7B, 2L, 1D. The adventure starts in Lima with a city tour in the capital of the Incan Empire, Cusco. There is a visit to Machu Picchu a UNESCO Heritage Site to then head to Quito to a colonial city tour. Then, visit Peguche with its traditional lagoons and the Imbabura volcano, enjoy of an overnight stay at the Karanki Magdalena Community to later cross by train to the Afro-Ecuadorian community of Salinas. Continue the adventure in a comfortable luxury cruise in the Enchanted Islands. City tour of Cusco which was the capital of the Incan Empire. It includes the main square, the Cathedral, its extremely sober renaissance façade contrast with the baroque and plateresque style of its interior, and Koricancha, a famous temple dedicated to the sun. Overnight. Guided visit to Machu Picchu, “Lost city of the Incas” UNESCO World Heritage Site. Machu Picchu was built in the classical Inca style, with polished dry-stone walls fitted with masterful precision. Its primary buildings are the Intihuatana, the Temple of the Sun, and the Room of Three Windows. Overnight. 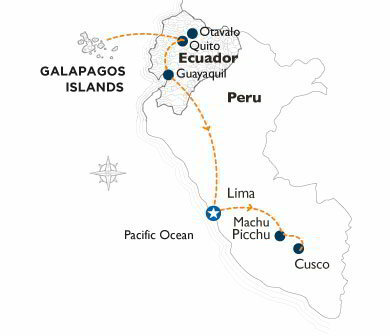 Guests will be transferred to the airport to take a flight from Cusco to Lima and then from Lima – Peru to Quito – Ecuador. Welcome to Quito! A representative will welcome you and transfer you to your hotel. You will have free time to explore the city or relax and settle in. Take a walk through bustling streets and squares of the largest historical old town in the Americas; a multi-ethnic, artistic and a UNESCO Cultural Heritage Site. The tour includes parks like El Ejido and Alameda, the gothic Basilica of the Heart of Jesús, Independence Square by the Presidential and the Archbishop’s palaces dated back to XVII and XIX centuries and, the Metropolitan Cathedral with excellent samples of the Spanish Renaissance. Walk along the so-called street of the seven crosses and pass by the Jesuit convent, El Sagrario church, the Jesuit temple of La Compañía de Jesús, perhaps the most important monument of Baroque art in Quito. From there we continue to the Plaza de San Francisco, temple, and convent. Overnight stay in the city. Depart to the Galapagos in a 2:30-hour domestic flight arriving at Baltra or San Cristobal Airport. A representative of our cruise ship will welcome you, and then you will be transferred to the port to embark the vessel. Enjoy of a paradisiacal destination marked by its uniqueness which inspired Charles Darwin on his Theory of Evolution. Every day visit two new places, and wake up with the most idyllic landscapes, to later enjoy a buffet-style breakfast and time to get ready for the first excursion. Every island and visitor site offer different geographical landscapes, fauna, and flora, but every corner of the archipelago will be filled with wildlife. From blue-footed boobies in their mating dance to lazy sea lions sunbathing by the shore, or fast-swimming penguins next to you in the snorkeling activities. All our guest will return to the ship for a varied lunch-buffet and free time to relax by the pool, sun terraces or Jacuzzi of our open decks while we arrive at our next visit. Get on a dinghy ride with a Galapagos naturalist expert and learn more about geology, evolution, human history and biology of the next visitor site. Once again be amazed by the different terrain, exotic animals, and plants. Start with a hike through natural paths and have close encounters with the inhabitants of the area. Then, have some free time to enjoy the crystal clear waters of the beach, or choose to snorkel, kayaking or glass-bottom boat adventure. 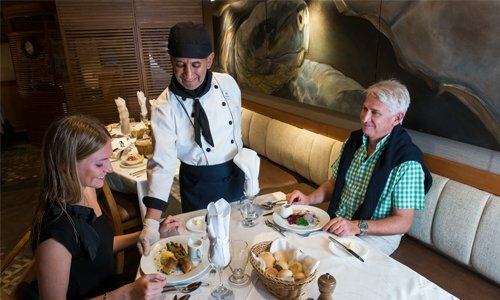 Return on board to get changed and comfortable to later enjoy of a-la-carte dinner in our acclaimed Lonesome George Restaurant which serves local and international specialties. One evening, we will surprise you with an al-fresco BBQ on the highest deck with great quality cuts, salads, and seafood for the ultimate Galapagos experience: dining under the sunset. After dinner, there will be a short but entertaining lecture about next day excursions followed by free time to relax or join an onboard activity. In your last day, breakfast will be served a bit earlier than usual to take advantage of the morning and take part on a last excursion in the islands. Back on the vessel, we will cruise back to Baltra or San Cristobal Airport to transfer our guests to their flight back to Quito or Guayaquil. 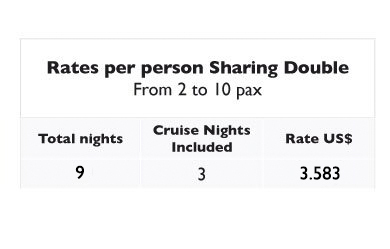 Once in the mainland, one of our representatives will transfer you to your hotel for an overnight stay. If you are taking an international flight, we will transfer you to the international airport in Quito or Guayaquil. You can also extend your stay in Ecuador with our other land tours.